Subscribe tonight for $249 / year or tomorrow for $699 / year. Share this with friends, and hide this from enemies. 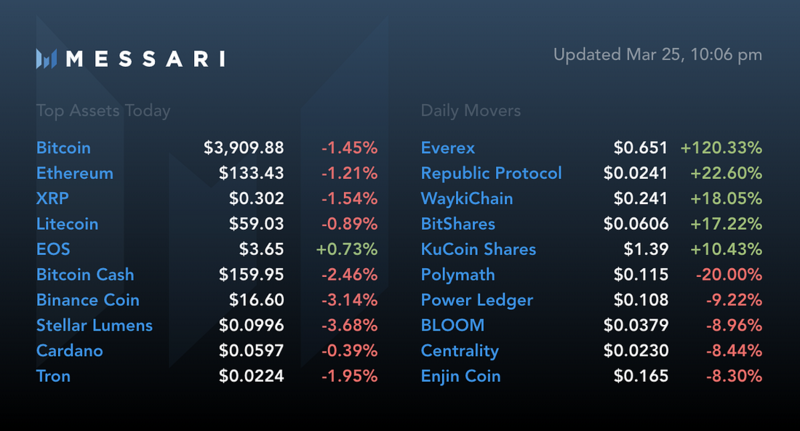 + This week we’ll be rolling out two critical new metrics on Messari's OnChainFx dashboard: “Real 10 Volume” that represents legitimate trades on global exchanges, and "Liquid Market Cap” that represents an improved proxy for the true outstanding supply of a given cryptoasset. These metrics are the product of a year's worth of research on token market data, and tie to our Y2050 and Y+10 market caps that we published earlier this month. + Our "Real 10” exchanges mirror those from the recent Bitwise Investments markets data research report. + In the months ahead, we will work with additional exchanges to add their clean order book data to our feeds and onboard them to Messari’s new exchange registry. Since we first introduced the idea behind Messari in late 2017, we’ve had visceral reactions to some of the inaccurate and misleading data coming from token teams, exchanges, and industry data aggregators alike. We knew we could do (and needed to do) better in order to help the industry mature and welcome new institutional investors. This week’s upgrades to our OnChainFx data inputs reflects a year and a half of work building more reliable crypto reference data. Not only are we excited to introduce "Real 10 Volume" and “Liquid Market Cap,” but these metrics will become default components of the OnChainFx dashboard, as they represent a meaningful upgrade to existing alternatives. Volumes are more than a mere comparison metric for investors looking to choose a liquid exchange. They are necessary inputs that feed spot price indices for asset managers like Bitwise and data services like Messari. Indices usually use something called a volume-weighted average price (“VWAP”) to aggregate disparate exchange prices into a single reference rate. While indices can vary in methodology, they all require reliable historical trading information from the constituent exchanges that power their VWAP calculations. Without a healthy VWAP, spot market pricing can be unreliable and/or manipulated, leading to the potential mispricing of market cap-weighted baskets of assets, improperly executed trades, and unreliable derivative financial instruments that would otherwise help professional investors gain access to crypto. If you haven’t yet read the Bitwise report (we linked to Friday), we encourage you to soon. It’s one of the best articulated industry research reports we’ve read. We won’t reinvent or regurgitate their presentation. In brief, Bitwise meticulously laid out their analysis of true exchange trading volumes, highlighting order book discrepancies at exchanges that had clearly inflated their numbers, and contrasting those figures with data from exchanges who reported legitimate trading volume. Their analysis mirrored a similar internal exercise we had done when evaluating the constituent exchanges we would use for calculating our VWAPs. Reported (read: inflated) volumes are still available as a customizable filter, but we do not recommend using this for analyses which require high-fidelity data. In the coming months, we look forward to working with the “Real 10” exchanges, as well as our temporarily excluded exchanges, on the new Messari Exchange Registry, which aims to aggregate clean order book data, and other material information from global crypto exchange leaders. We are also excited to roll out our “Liquid Market Cap” alternative to “Reported Market Cap” this week. We believe this more accurately reflects the outstanding network value of top cryptoassets than other commonly-cited reference valuations. Liquid Market Cap is the product of our asset prices (methodology here), and our research team’s “Liquid Supply” estimates for the Top 50 assets plus Messari token registry participants. We will continue to add supply curve analyses for assets outside of the Top 50, and are working to provision this data for our API customers in Q2. Astute observers will note that our "Total Liquid Market Cap" is now significantly lower than those reported by other data aggregators, such as CoinMarketCap (as such, our bitcoin dominance is also higher). This is because we a) exclude "restricted supply" from our Liquid Market Cap calculations (e.g. contractually restricted XRP & XLM supply), b) discount Tether-denominated trading prices, which have historically been filled at a premium to their fiat spot alternatives, and c) exclude stablecoins. On that final point, we believe Tether and regulated stablecoins such as USDC and Paxos inflate Liquid Market Cap inappropriately as they are collateralized by fiat currencies and thus not digitally native. “Censorship resistant” stablecoins such as Dai are also excluded from liquid cap as they are derivatives of collateralized assets, which are already accounted for in our Liquid Market Cap calculations. We will instead account separately for Total Stablecoin Market Cap as it seems appropriate to distinguish between the two. As always, we welcome feedback on our methodologies (supply, price). In the meantime, we hope these upgrades help better inform investors looking to dip their toes in the crypto water. Every weekend, we dig through the past week’s posts from crypto’s other great sources of content to see what we missed in our own weekend reads. Recently, the SEC released a letter asking for input on how digital assets may impact its ‘Custody Rule’ as under the Investment Advisers Act of 1940. Katherine Wu breaks down what custody means in regards to this regulation and why the SEC is concerned about the lack of intermediaries in peer-to-peer digital asset transactions. The custody rule in this case only applies to investment advisors but Wu provides a good basis for understanding the differences between how traditional securities trade and how the SEC views digital asset trading. In this 66 page report Electric Capital takes an in-depth look into developer activity on public blockchains. The report found that the number of developers working on public cryptoassets has doubled over the last two years, with Ethereum claiming the largest developer team. Furthermore, the report found that projects that have been abandoned tend to be forks of high value chains Bitcoin. Bitcoin is an innovative technology, built on decades of academic research and other technologies. Linked timestamping, Merkle Trees, and even proof-of-work were academic ideas proposed to solve a variety of problems. Now these technologies are core to many public blockchains. ElSeidy provides an overview of the origins of these concepts based on a longer paper by Prof. Arvind Narayanan of Princeton.